When the Rooms became vacant in 2012 OPT stepped in. We managed to negotiate the remainder of the lease until 2013 and got thinking and working. We hosted a symposium of experts to help inform the Conservation Management Plan carried out by Oxford Archaeology, and an Options Appraisal has also been completed with the support of Historic England. 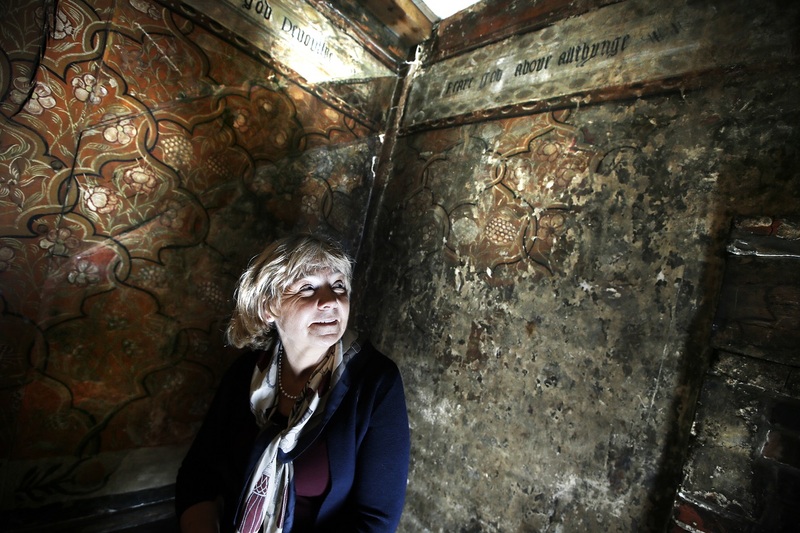 We are grateful for the continuing support of the Eyre Estate, the William Delafield Trust and CPRE Oxfordshire Buildings Preservation Trust who have provided funds to allow us to find out more about the house, the wall paintings and their condition, and what needs to be done. Since that time the head lease of the whole building has been sold to a family Trust as an investment and the Painted Room returned to them. We are hugely grateful to the Eyre Estate who have given OPT possession of the Painted Room and we were very excited to sign a 10 year lease with them in 2017 to formalise OPT’s access. 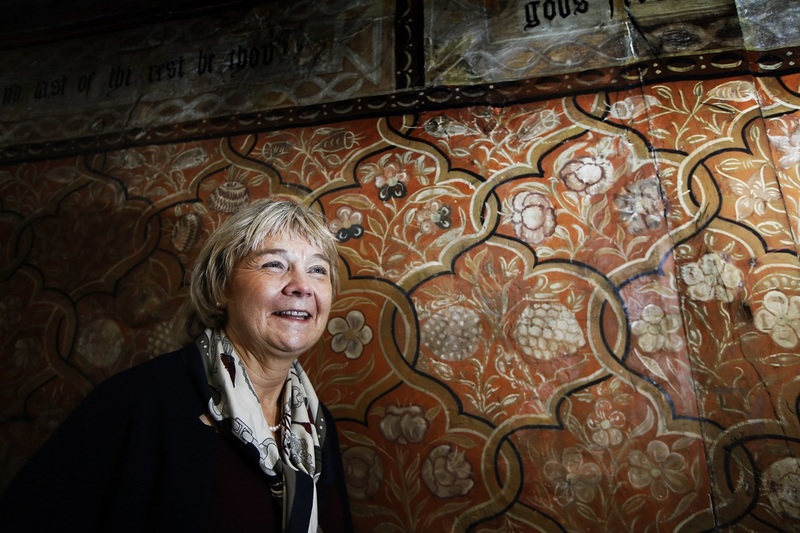 With a lease in place, we can move forward, seeking funding which will allow is to open the rooms to the public, conserve the wall paintings and secure them forever. In Autumn 2017 wall painting expert Madeleine Katkov carried out emergency repairs to the wall paintings to stabilise them and returned in March 2018 to finish this initial emergency work, working with a student from Cranfield University. Following advice, we have removed the rollered panelling, which has been in situ since 1927, which will enable work to begin on paint analysis. The panels are carefully stored in one of the upper rooms and will be reinstated in due course. In 2018 we have also welcomed Heritage Consultants Nick Worlledge Associates to one of the upper rooms on the top floor as a start in our plans to provide offices and a reading room. Nick was conservation officer at the city so knows it well, and is unlikely to cause the same controversy as previous tenant Thomas Sharpe, Oxford Replanned. Sharpe's plans for a Christ Church Meadow road were clearly being discussed with the then OPT Secretary, John Betjeman, as a recent letter in the City’s archive reveals. Thanks to Dr Malcolm Graham for this discovery which will add to the work by Oxford University student Kirsty Walk who collated all of the information we currently have on the Painted Room as part of a 1 week internship with OPT. Students studying Archaeology at Oxford University also visited the Painted Room recently to witness dendro dating in action. Samples were carefully taken to try and gain a more precise date on the age of the timbers. Unfortunately, the samples taken did not yield any firm results. We try our very best to open the Painted Room as much as possible and make sure you check out our upcoming events, including the monthly Oxford Matters events and OPT’s annual celebration of Shakespeare’s birthday which will see us open the Painted Room on Sunday 22 April. Click here for more details.